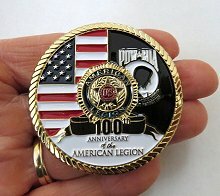 The American Legion Auxiliary is the world's largest women's patriotic service organization. They are proud to be helping for over ninety years of "Service Not Self, for Veterans, God and Country." ALA Unit 376 was chartered December 1, 1924. Saturday, May 4, 2019 - Cinco de Mayo dinner. 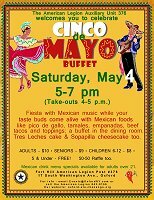 Buffet is from 5-7 p.m.with take-outs at 4:30 p.m. Come and celebrating Cinco de Mayo (Spanish for "fifth of May" - however, ours is on the closest Saturday) with a special Mexican buffet dinner from 5 to 7 p.m. This is a Mexican “fiesta” and you’re invited to have a delicious, “festivo” buffet meal, listen to Mexican mariachi (ranchera) music, participate in a raffle, and enjoy very colorful decorations, all while supporting the educational and charitable ALA missions. Monday, May 6, 2019 is the Chenango County ALA dinner-meeting at the Edwin Wilbur Jr. American Legion Post #1478, 1136 County Rd. 5, McDonough, NY. (607)-674-9217. All CCALA meetings are at 6:30 p.m. [usually] on the first Monday of each month [except not in Jan, July, Aug. It's on Tues in March].) Business meetings begin at 7 p.m. County ALA officers are - Pres: Joy Lawrence; 1st Vice: Sophie Liberatore; 2nd Vice: Barb Pierce; Membership: Mary Lou McAvoy; Treasurer: Resi Fuller; and Secty: Angela Jones. Tuesday, May 14, 2019 - will be our eighth (regular) ALA Unit 376 meeting, (on the 2nd Tues of the month). FYI- We do not usually serve food at our meetings. If you want to bring something like cookies to share you could, but it's not expected. We will judge the Poppy poster contest, discuss the Monday, May 27th Memorial Day parade and Poppy Princess, EGS, officer elections and more. Our Oxford Post 376 celebrated its 100th anniversary on March 16, 2019. We received 2 beautiful proclamations from US House of Representatives Anthony Brindisi and NYS Assemblyman Clifford Crouch! 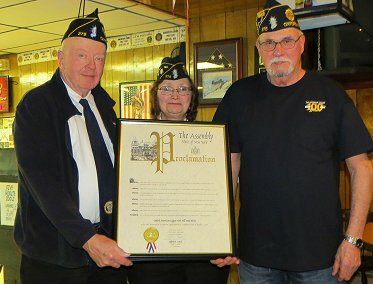 At left are Post 376 Legionnaires Ernie Spicer, Commander Darlene Ardron and Ron Blanford with the Assembly proclamation..
Did you know: there are 3 American Legion Posts in Chenango County that are "Centennial Posts" and they are Norwich Post 189, Oxford Post 376, and New Berlin Post 348. A beautiful commemorative coin is available at the Oxford Post Sunday Breakfast (by the register) and by the bar and the Norwich Post bar for $8. The reverse side features a list of all 11 Posts with the Centennial ones listed at the top. NEW: Our Unit 376 Constitution and Bylaws as well as our Standing Rules have been updated and officially approved by Dept. Read them to learn the rules we follow. Both docs are PDF links at the top of the "Q and A" list on the FAQ page. 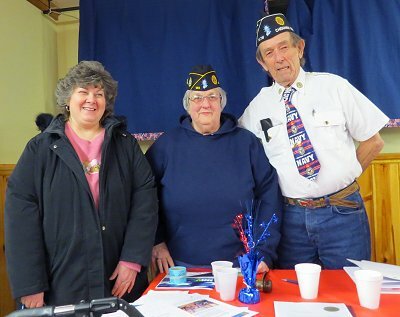 The fifth Chenango County ALA meeting was a special day: Tuesday, March 12, 2019., held at Post #876, 15 S. Main Street, Sherburne, NY- it was the American Legion's 100th Birthday meeting! There were historic pictures, a WW1 - Vietnam era uniform display from the Oxford Historical Society, and 20's era music to reflect on these first 100 years. We had our first Poppy Poster Contest in two of the Oxford Academy schools. Visit the Poster Contest page to see the posters and see who won! ALA dues have gone up for 2019! Yes, folks it's true, we had to raise our rates because National raised theirs. $3.00 for adults and $1.25 Juniors. That means your dues are: $28.00 - Adults; and $6.25 - Juniors. Juniors $6.25 breakdown: National Rate (increase from $1.25 to) $2.50 + Department (no increase) $3.75. Our Unit portion: -0-. The American Red Cross is back at the Fort Hill Post 376 for another blood drive on Saturday, May 11, 2019, from 7:30 a.m. - 12:30 p.m. (It's usually on the 2nd Saturday.) They ordinarily take walk-ins, but making an appointment is a much better idea. You can even go online for the screening questions. Visit the website: http://www.redcrossblood.org/ FMI/to find a location near you. "Urgent: Blood Donors Needed!" Any questions, contact Tami Zebrowski-Darrow, 6th D. Field Service Rep. Click for complete schedule Volunteers always wanted! On Dec. 16, 2018, during the Sunday Community "Breakfast with Santa", when the Oxford Community Youth Center volunteer “elves” were serving, I think we had a record breaking crowd! 240 people were served. Everyone there did a great job!!! Let's see if the Easter Bunny draws as big a crowd on April 21, 2019!!! 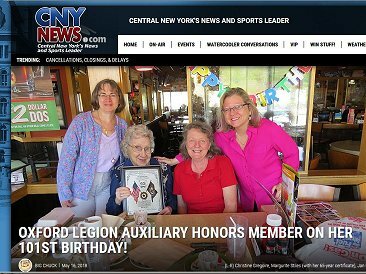 May 9, 2018: officers Jan Pollard, Christine Gregoire, and Jeanie Petersen honored a very special member - Marguerite Stiles - with a 65-year ALA member certificate and lunch out at Applebee's in Vestal to celebrate her 101st birthday! Happy Birthday Marguerite!!! We had a lovely afternoon together. The news coverage was aplenty! The photo at right was a full screen image at the CNY News website! Even Sen. Akshar plans to send a birthday wish to Marguerite. News Flash! - we're on pg. 10 of the (National) Auxiliarymagazine, Aug. issue. Wow! TELEVISION COVERAGE '13: Monday, May 27th, 2013, was the Legion's Memorial Day Parade and Ceremony. (Read more on the fundraising page under Events.) It was filmed by Channel 12 Action news. It's modest, but be sure to see it here! They have a few photos too. The ALA focuses on three major areas: Veterans, Young People, Americanism and the community. On the local level, the Oxford ALA has over 200 members, giving many volunteer hours to help the initiatives and programs of the Oxford Legion and the Oxford community. 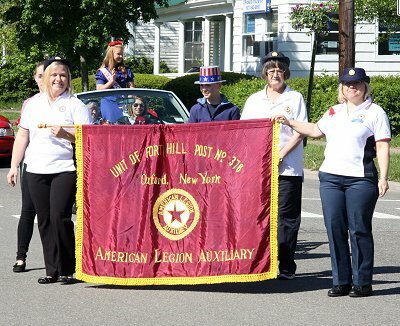 Oxford Auxiliary members have achieved their own unique identity while working side-by-side with the Legionnaires and the Sons of the American Legion (SAL's), of Fort Hill Post #376. They have the honor of marching in the Memorial Day parade but they do a lot more! The ALA is involved in youth activities such as the Oratorical Contest and Girls' State. Some members volunteer at the NYS Veterans' Home, nursing homes, food and clothing banks, and they organize fundraisers like Bake Sales and Soup Sales, Memorial Poppy sales, and the Cinco de Mayo fiesta dinner. They have even established an American Legion Auxiliary Scholarship. They're involved in other community projects such as promoting child literacy*; education; charities; and more. It is all accomplished with volunteers! *Each fall Unit 376 sponsors a Harvest Dinner to raise money for the Finch Memorial Book and Education Fund which donates books to the Oxford Academy Primary School. The Great Garage Sale Day & Bake Sale, has been canceled. Thank you to everyone for all your hard work.